The Man Who Was Thursday is adapted from a novel originally published in 1908, but I went into it knowing nothing and I cannot recommend this approach enough. Currently running at Lifeline Theatre, The Man Who was Thursday is a lovely byzantine maze of subterfuge, false identities, and plot twists, and the less you know going in, the more fun you’ll have. This show is about one man, Gabriel Syme (Eduardo Xavier Curley Carillo), and his attempts to infiltrate and/or ingratiate himself into London’s seedy anarchist underside — the leader of which, the mysterious and ominous Sunday (Allison Cain), is the subject of much awe and fear among the anarchists. Assassination plots, undercover police officers from Scotland Yard, and fake moustaches abound, and script adaptor Bilal Dardai has done a masterful job of balancing genuine suspense with extravagant thriller theatrics. The set, designed by Lizzie Bracken, is as mazelike as the plot. Enormous brass arches cut a diagonal path across the ceiling, embedded with lights that change color to eye-pleasing effect. Below that is a raised walkway with an iron-looking balustrade and steps to either side that lead down to the stage. These two levels provide a dizzying sense of height, and are used to great effect as many different locations; characters climb up onto balconies, down into secret sewer hideouts, and up onto bridges. On the bottom level, meanwhile, set pieces pop in and out of three smaller wooden arches, and the wall is covered with a green wood lattice that feels both authentic to the time period and pleasantly airy and bucolic. It is a set that is a story unto itself, one you want to climb around on and explore, like an old mansion. The lighting (Eric Watkins) and the music (Christopher Kriz) are both successful in creating an atmosphere of genuine suspense, but also are the source of some hilarious gags that emphasize the story’s inherent ridiculousness and prevent the play from taking itself too seriously. But the really masterful stuff here comes in the form of the costuming and makeup, co-created by designers Caitlin McLeod and Anna Wooden. Each actor in the show needs to convincingly play not only multiple characters, but characters who are capable of disguising themselves over several different identities. Through clever uses of facial hair, accessories like goggles, glasses, and hats, and costume pieces suited to each character’s personality, McLeod and Wooden help create personas for every character which are visually distinctive, dynamic, and fascinating. Of course, a great deal of this work also comes from the actors, who all work on differentiating characters with subtle changes in posture, speech, and movement. The dialect work is strong, an impressive feat from the ensemble and dialect coach (Elise Kauzlaric) given the pan-European accents on display. And the combat from fight director Greg Poljacik is bombastic, entrancing, and unafraid of embracing its own theatricality — particularly one fantastically over-the-top swordfight in Act Two that is the craziest, swashbuckling-est thing I’ve ever seen. But of all the things The Man Who Was Thursday has to offer, the casting is what really jumps to the forefront — it was not only racially inclusive, but upended notions of gender as well. The original novel being a product of its time, the characters in this 1908 British spy thriller are overwhelmingly male and European. 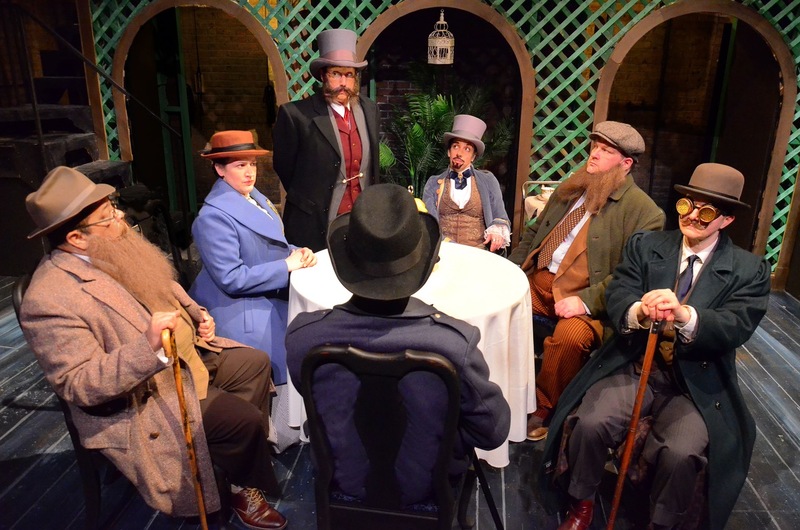 It would have been all too easy to make this an all-white, nearly-all-male cast, and excuse it by claiming historical accuracy, as a depressing number of theaters have done with similar works set in the past. But to do so would have been to miss out on some of the most memorable performances in Chicago this year. Eduardo Xavier Curley-Carillo is utterly spellbinding as our protagonist Syme; Chesterton’s lush language rolls off his tongue with precision and sly wit. Jen Ellison is silent and terrifying enough to make your knees buckle as the terse, ominous German anarchist Dr. Bull. And Allison Cain has a boisterous, commanding, and equally terrifying presence as anarchist leader Sunday. If I could address every cast member I would, there is impeccable work across the board in this production. Now, there are several characters who match the race or gender of their actor, and they are awesome too. But by choosing to cast without regard to either of those things, director Jess Hutchinson has made a choice that not only advocates for diversity, but which places emphasis on the constructed reality of what we’re seeing. True, it might not be accurate to the time period, but in lieu of accuracy, our suspension of disbelief has no choice but to rely on the theatrics, the execution of the thing. And not only does it succeed with flying colors, it brings a universality to the story that might have been missing otherwise. The Man Who Was Thursday is the rare show that feels like every designer, director, and actor is fully firing on all cylinders, and as a result it is packed with energy, enthusiasm, and fun, while never losing its macabre touch. It is a heightened thrill ride that still rings relevant despite its nostalgia-coated center. The Man Who was Thursday runs at Lifeline Theatre through April 7th.